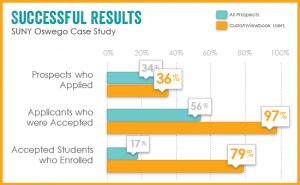 “Going All-In On Prospective Students” Webinar is Available! The 2nd of our ENGAGE Z webinar series, “Going All-In On Prospective Students: How To Improve Your Web Content Strategy” is available. Our presenter, Tony Rose, Partner and Executive U/X Strategist at Digital Wave Technologies, has generously made a copy of the presentation available to anyone interested. We also have a recording of the presentation we can share with you. Please contact Mary Pannullo at mary.pannullo@customviewbook.com to request these materials. To Your Success – and a Happy Thanksgiving, too! Hear from Executive UX Strategist and Partner at Digital Wave Technologies, Tony Rose. With Tony, and our own James Horigan, EVP of CustomViewbook onboard, a depth of good information and insights will be shared! And, we’ll leave plenty of time for Q&A. 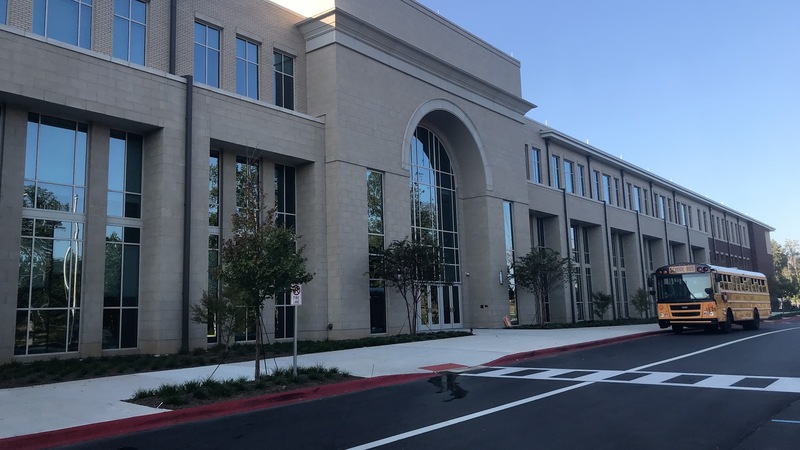 James Horigan, EVP of Antech Systems Inc., and our fearless leader at CustomViewbook, was recently appointed to the Auburn, Alabama High School Tech Career Program Advisory Committee. James will help provide the insights and expertise to ensure that Auburn’s Tech Career Program is providing high schools students with relevant technology courses and skills to be prepared for future success. He will also participate in helping to forge productive relationships between the Career Tech Program and the Auburn business community. This appointment will also continue to help us glean insights into how Generation Z uses and adopts technology in the classroom, and while self-educating. A topic the CustomViewbook continues to be passionate about! NACAC Boston Was A Trip! James and I really enjoyed meeting many of you in Boston. 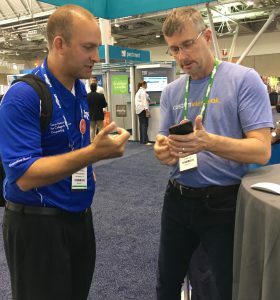 We got into some great, engrossing conversations – just what James and our friend, Brad Durschlag of Trinity University of San Antonio, are doing in this photo. 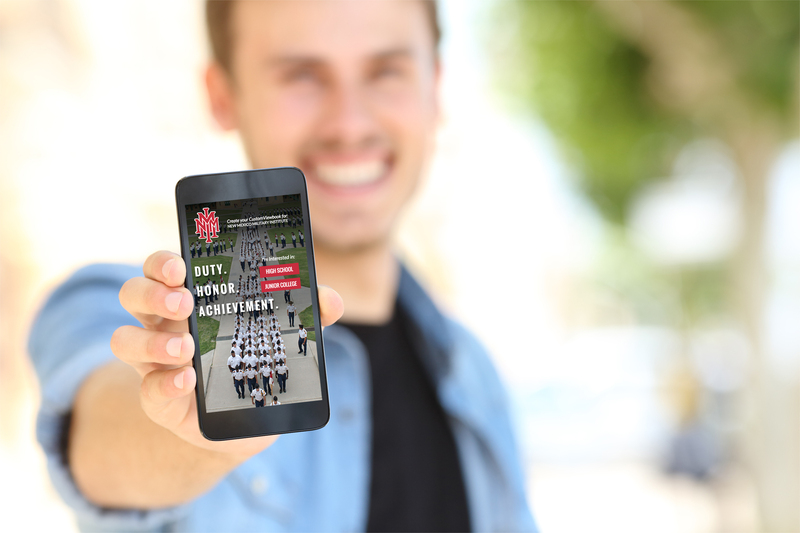 Some of you were surprised by the level of interactive experience CustomViewbook provides prospective students. This “mobile first” and fully interactive platform engages students with embedded videos, links and features like photo viewers and more info callouts. They can select all the information they need and want about your academics, student life, career opportunities, financial aid, and more. The platform presents content that is beautiful and responsive for mobile, and across all device screens. Instantly, students can view their personalized digital viewbook on their smartphone, tablet or laptop! They can even connect with Admissions via text, schedule a visit, or apply. Clients get the most highly-qualified prospect profiles available. The CustomViewbook platform effortlessly captures highly-qualified prospect profiles, including a significant percentage of out-of-state and international prospects. You’ll have the data and analytics you need to better focus time and resources on the prospects who are most likely to apply and to become enrolled. Print campaigns become more targeted, efficient – and much less costly. Results have been powerful. I can’t wait to show you what CustomViewbook can do for you! The first of our newsletter / webinar series, ENGAGE Z: What Matters in Online Communications for College Admissions Professionals has gotten great feedback from college admissions folks from all over North America. Onward – to your Success! The College at Brockport is Launched! We’re thrilled to have The College at Brockport, State University of New York, onboard as a new client. Founded in 1835, Brockport has a rich history and many current notable achievements. Brockport has been voted the among the “Best in Northeast Colleges” and “Green Colleges” by The Princeton Review, and among “America’s Best Colleges” by the US News and World Report. The College offers 50 undergraduate majors, 50 graduate programs and 18 areas of teacher certification and combined bachelor’s/master’s programs. Brockport offers one of the nation’s largest Study Abroad programs, a variety of internships with major corporations, 23 NCAA intercollegiate athletic teams, arts and cultural events, and more than 60 clubs and organizations. Among its faculty are several Fulbright scholars, three Distinguished Professors, and a winner of the 2007 Flannery O’Connor award for fiction. Whew! Stay tuned. Great results are in the makings! The smartphone is an extension of the self for the generation that has grown up living and learning online. Their experience and perception of you via your website, right at initial inquiry, is a key touchpoint to compel engagement with them. The numbers tell the story! More than 80% of Generation Z own a smartphone. At initial inquiry, nearly 4 out 5 of your prospects will be viewing your website through a 5” lens. GenZers have grown up in a culture of short, fast, on-demand transactions and immediate pay-off. It’s all around us now – think Snapchat, Instagram, Amazon 1-click. Unlike the generations that have grown up in the transition to the online world who have been willing to learn new systems and tolerate bad design, GenZers expect a user interface to be intuitive and mobile apps to just work. Testing shows that they will “just move on.” So, when it comes to engaging GenZ, designing for mobile interaction is a must. It’s summertime and the weather is HOT. We hope you’re taking some time for a well-deserved break. is free, fun and will help college admissions and marketing professionals learn how to better understand, reach, inform, and get GenZers actively engaged. Can’t wait to talk with you! The Journey of Future Leaders from Widener University… Starts with CustomViewbook! We’re stoked to have Widener University onboard as one of our newest CustomViewbook clients. With a beautiful main campus just outside of Philadelphia, PA, Widener provides its students a living laboratory to earn practical experience through internships and co-ops. Widener has more than 60-degree options, and offers top-ranked programs in nursing, engineering, social work and the arts & sciences. Whether on a journey toward an associate, baccalaureate, master or doctoral degree, Widener students and alums are poised to make the grade in learning and life. We’re looking forward to the launch of their great-looking CustomViewbook. And, the transformational results that will follow. Stay tuned! 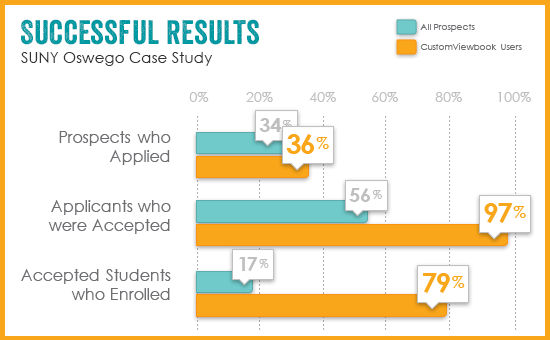 Client data shows that CustomViewbook users are 4.5x more likely to apply and become enrolled than the general population of student prospects. We’re excited to be at the Super Conference and have you check it out for yourself! Stop by the CustomViewbook Booth, meet James Horigan, our EVP, and demo the CustomViewbook Digital Platform™, Recruiter App™ for iPad and ViewbookBlasts™. You’ll see why CustomViewbook is an easier, more effective way to actively engage student prospects throughout the recruitment funnel. Looking forward to seeing you in San Antonio!